If I had to label my January reading I'd call it emotional. No less than 5 of the above books made me weep. As always, it's hard to choose favorites. But, I've done it! There will be reviews for a good chunk of these coming up. How did January treat you? What was your favorite book of the month? January was quite an emotional reading month for me too - the appearance of tears did not happen though (I've never actually cried at a book). Here's to a more refreshing February! I'm kinda a wimp when it comes to emotions, lol. I'll boo hoo for hours over a movie or a book...or a really good commercial, lol. Between you and Catherine talking about it, it sounds like I totally need to get my hands on a copy of Belle Cora! Yes! Yes, you really do! I loved it. Oh, wonderful! I hope you can go to that, Chris. It sounds fascinating. I hope you like the book too! For a second I wondered if I was reading my own list... 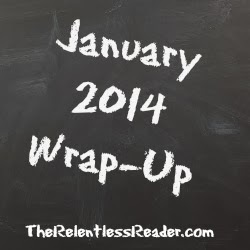 I read Code Name Verity and The Rosie Project this month too! They both fell in the "good but not great" category for me. I enjoyed them, but I think they fell victim to too much hype, in my case. Ah, rats. I hate when the hype gets to me. You had a great reading month! I'm definitely going to have to check out Belle Cora now. My favourite book of the month was The Harlot's Tale by Sam Thomas, which continues his Lady Bridget Hodgson series. I did, I did :D I think you would really like Belle Cora. Dare I guarantee it? Maybe! Once again, an impressive list. Well done! Of your list, I've only read Code Name Verity and The Rosie Project, but I loved both. Lol, thank you! I really liked both of those a lot too. I don't think I could pick between the two of them, they are so different. I think that's pretty good reading for a month. Thank you, Jane :) I'm very happy with the way January turned out for me. Thanks for visiting! Great month! Happy February reading! Oh, I don't think I could have handled reading it if I my kids were still that age. It busted me in half as it was. Once again, completely put to shame by your amazing month of reading! Nice work! Looks like you had a great reading month. Code Named Verity is on my tbr list. I've noticed the Rosie Project on many blog posts for the month. Happy reading! Pretty awesome, Jen! I loved both Suite Francaise and Gone Girl in January. Thanks, Charlie :D Oooh Gone Girl! Wasn't that a twisty ride? Yay, such a good reading month! I'm about to re-read The Rosie Project already - I just listened to it on audio a few months ago and I've been itching to read the hardcover ever since. Did you like it on audio? I'm wondering how his "voice" would come across that way. Hmm. I really liked Code Name Verity, but I know others who weren't crazy about it and I don't know why! I like that your reading for January was emotional. Mine was "meh". February is going better! Those people must be CRAZY, lol. ;) I hope you have a better February, Wesley! Thanks for visiting my blog. Favorite read: Headhunters by Jo Nesbø.